Ever walk into work, or a party or a family function and get that ‘Ruh roh, there be some crazy vibes up in here’ feeling? Sometimes, it’s a bit easier to spot. Your friend has the crazy eyes going on. Or your brother greets you at the door of a family function with a glass of wine in one hand for you, the whole bottle in his other hand — for him. Those clear, visual warning signs that there is some crazy going on. Or that the potential for crazy is high. But sometimes, you’re left to fend for yourself. Sometimes, the crazy sneaks up without warning. Wouldn’t a warning sign be nice? 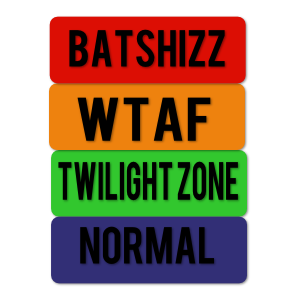 So, I was thinking about the threat level scale and how useful and helpful it would be to have a crazy threat level scale, ranging from sane and rational to batshizz crazy. I figure it could be helpful for many occasions; judging the crazy threat level for everything from the workplace environment, to social gatherings, to family functions, to blind dates. Indigo: Normal. All situations calm, peaceful, rational. This is ideally the default level. Hopefully. Green: Twilight Zone. All situations odd, strange, a little bizzare. But for the most part, harmless. Orange: WTAF (What the Actual F**k). All situations feeling some crazy. To the point where you’re looking around for the hidden camera, or pinching yourself to make sure you’re not having that crazy dream again. Red: Batshizz. All situations are BSC. Everything and everyone is so crazy that you’re starting to question that maybe you’re the one that’s nuts. Time to strap yourself in, cuz you’re in for one craaaaazy ride. If batshizz level were a hashtag it would be #whatisthisidonteven. So, there you do, internets. You’re welcome. …Wanna take a stab at where my day is falling on the crazy threat level scale?